Dr. Tejas Patel, achieved a key breakthrough in medical science, when he conducted the world’s first telerobotic surgery on a patient in Ahmedabad, Gujarat. This surgery was performed at a distance from the patient from a remote location using robotically controlled instruments, made possible by computer technology and advanced robotics. 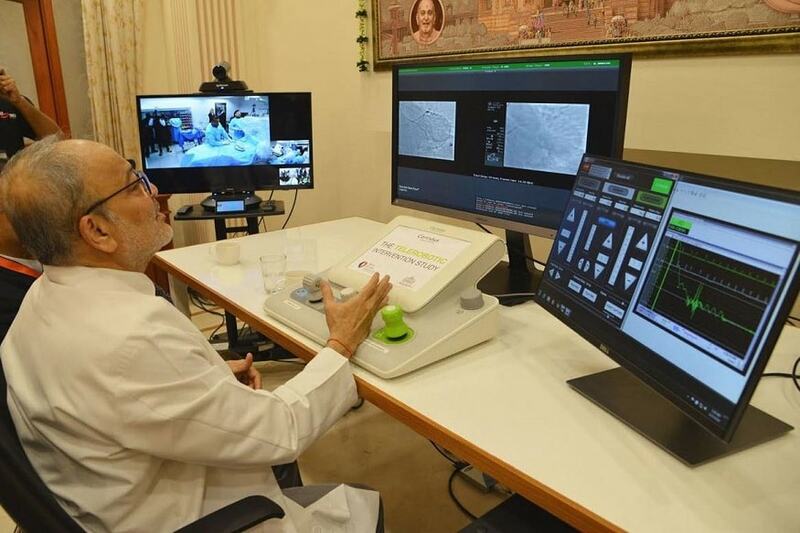 Dr Patel, who is the chief interventional cardiologist at Ahmedabad-based Apex Heart Institute, guided the robot to perform the surgery from the Akshardham Temple in Gandhinagar. The patient was a middle-aged woman with a blocked artery. Dr Patel has been widely using robotics for Percutaneous Coronary Intervention (PCI) or heart surgery, but this is the first time in the world that the surgery was conducted from a remote location outside the operation theatre. For the robotic surgery, Dr Patel used the Corpath technology of US-based Corindus Vascular Robotics.